Union Minister of State (IC) for Power, Coal, New & Renewable Energy and Mines, Shri Piyush Goyal launched here today the ‘MERIT app (Merit Order Despatch of Electricity for Rejuvenation of Income and Transparency)’ and the e-bidding portal for providing e-Bidding solution to States to select Independent Power Producers (IPPs) for procurement of power by transferring their domestic coal under the scheme of flexibility in utilization of domestic coal. Briefing the media on the occasion, Shri Goyal said that both the initiatives are taken in the direction of Prime Minister Narendra Modi’s vision of ‘Minimum Government and Maximum Governance’ through ‘Speed, Skill and Scale’. The app and the web portal would result in optimum utilization of Coal which would save the consumer close to Rs. 20,000 crores five years down the line, the Minister added. Shri Goyal said that use of technology to increase transparency and accountability and transfer maximum benefit to the consumer reflects a 360-degree approach of a ‘Government in Action’. The Government is dedicated to ensure access to affordable, quality, 24x7 Power for All, in Prime Minister’s vision of New India, the Minister added. Over the last three years, India has rapidly achieved adequacy in terms of availability of power. Now the time has come to shift the focus to optimal utilization of the valuable and scarce energy resources for achieving economy and efficiency in operation. The merit order stack is a common approach to the problem of minimizing the sum of generators’ operating costs while honoring the operational constraints of the available generation to supply the demand in a secure and reliable manner. The Tariff Policy, 2016 provides that the States/DISCOMs shall follow merit order for procurement of power and there should be uniformity in merit order mechanism. During the Power Ministers' conference held at Vadodara in Oct, 2016, it was decided to constitute a Committee to examine the status of implementation of Merit Order Dispatch, issues involved therein and for ensuring proper dispatch of renewable energy sources while following the merit order principle. Accordingly, Merit Order Dispatch Committee was constituted in October 2016 with Chairperson, Central Electricity Authority (CEA) as its Chairperson and Joint Secretary (OM), Ministry of Power (MoP) as its Member Secretary. The Committee had representation from MNRE, CERC, POSOCO and States. The Committee submitted the report along with recommendations to MoP. The recommendations of the Committee have been prepared with regard to Transparency in Merit Order operations and promotion of Renewables through effective implementation of Must-Run status of Renewables. Most states follow merit order operation; however, details in this regard need to be made transparently available. Hence, there was a need to have a mechanism to quantify deviation from merit order and check its reasonableness. The adherence to merit order optimizes the power procurement cost and benefits both utility and ultimate consumer. 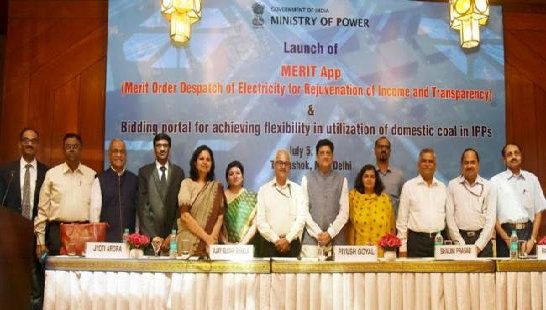 In this direction, a web portal and mobile apps for Merit Order Despatch of Electricity (MERIT) have been developed in association with POSOCO. The app displays extensive array of information regarding the merit order such as daily state-wise marginal variable costs of all generators, daily source-wise power purchases of respective states/UTs with source-wise fixed and variable costs, energy volumes and purchase prices. The app also gives information regarding reasons for deviation from merit order such as must run conditions, transmission constraints etc. The flexibility in utilization of domestic coal scheme envisages transferring coal to more efficient IPPs generating stations, leading to lower generation costs and ultimately lesser cost of electricity for the consumers. Today, the Minister also launched the e-Bidding portal, which has been designed to facilitate States in inviting bids for procurement of power from the prospective IPPs in transparent and fair manner. The successful bidder shall be selected through e-Reverse Bidding process. The Cabinet, on 4th May 2016, approved the proposal for allowing flexibility in utilization of domestic coal amongst power generating stations. Central Electricity Authority (CEA) has issued the methodology for utilization of domestic coal within State/Central generating stations on 8th June 2016, followed by the issuance of a memorandum by the Ministry of Power on 10th June 2016. The methodology for use of transferred coal in Independent Power Producers (IPPs) generating stations was issued by Ministry of Power on 20th February, 2017. Ministry of Power, along with PFC Consulting Ltd and MSTC Ltd, has developed the e-bidding portal. The link for portal is available on the website of Ministry of Power and PFC Consulting Ltd. Other dignitaries present on the occasion included Shri Ajay Kumar Bhalla, Secretary Power and other senior officers of the Ministry of Power.